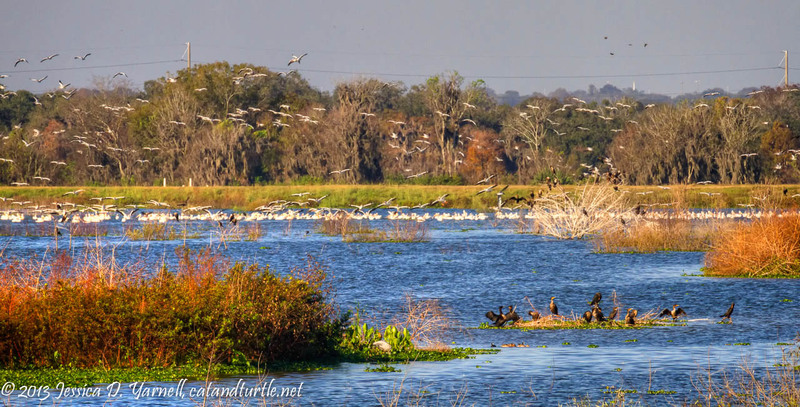 Blog > Beyond the Backyard > Lake Hancock Outfall Wetlands > Lakeland Christmas Bird Count 2013 – I Found Pelicans! 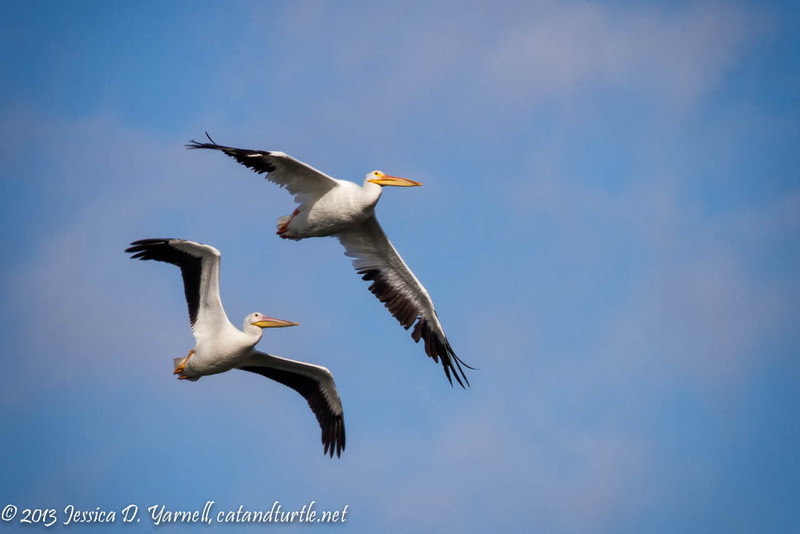 Lakeland Christmas Bird Count 2013 – I Found Pelicans! Yesterday I was excited to be invited to participate in the Lakeland Christmas Bird Count (CBC). Christmas Bird Counts are a long-standing tradition among birders and scientists. All over the country, teams of people go out on a specified day to count as many birds as they can. The species totals give a measure of the health of the bird population, and help to direct conservation efforts. If you’ve ever seen the movie The Big Year, that’s a little what this day is like (on a one-day, tiny regional scale!) Typically birders have a pretty good idea of the birds they expect to find in an area. They scout the area for rarities in the weeks before the count, and then on Count Day, it’s important to make sure as many birds as possible are found! I chuckled as I observed the friendly rivalry between teams in our area. I was thrilled when Cole Fredericks asked me to join in on the count, because I knew it meant an opportunity to spend a day with very knowledgeable birders. I figured I would learn a lot about bird identification, and hopefully find a few lifers for my life list. What I didn’t realize was that I was being offered an opportunity to enter Birding Paradise: an access-restricted SW FL Water Management District property located near one of my favorite places, the Circle B Bar Reserve. The outfall wetlands, located on the south side of Lake Hancock, are just amazing – like Circle B used to be. There are thousands of birds there. It was an incredible day! Lakeland Christmas Bird Count map. The circle indicates the entire area that was counted by about twenty teams. My group covered the Outfall Wetlands and several other properties to the east of Lake Hancock. It was a privilege to have access to access-restricted Birding Paradise! Our day started at 5 in the morning. We spent an hour or two “owling”, which means we hiked to likely owl habitat and played calls to try to get birds to answer. That’s the best way to find owls at night, when they are most active but you can’t see them! We also tried for Whip-poor-will and rails. “Tried” is a good word, because none of the birds answered back! But I got a chance to practice birding by ear (identifying birds by sound, rather than sight). Our best successes were Least Bittern and Sora – there were dozens of Sora in the wetlands, and their laughing call seemed to mock the birders who could hear them but not see them! Outfall Wetlands Sunrise. The sun was huge and orange as it burned through fog. A cooperative flock of egrets flew by at the right moment. Click on the photo to view larger. As the sun rose, I regained use of my primary birding sense — sight! — and we began counting in earnest. My primary mission on our team was to photograph rare birds. Our Lakeland Christmas Bird Count doubled as a survey of the area for the Lake Hancock outfall wetlands project, which is being monitored for conservation efforts. Known rarities in the area included Black-necked Stilt and American Avocet. I was surprised to learn that the Black-necked Stilts and American Avocets can be found in the wintertime, so far inland. Cole explained that stilts winter very sparsely in the southern half of the peninsula. Avocets are pretty rare inland, but phosphate mining activities have produced lots of attractive habitat (settling ponds and such) for these species. 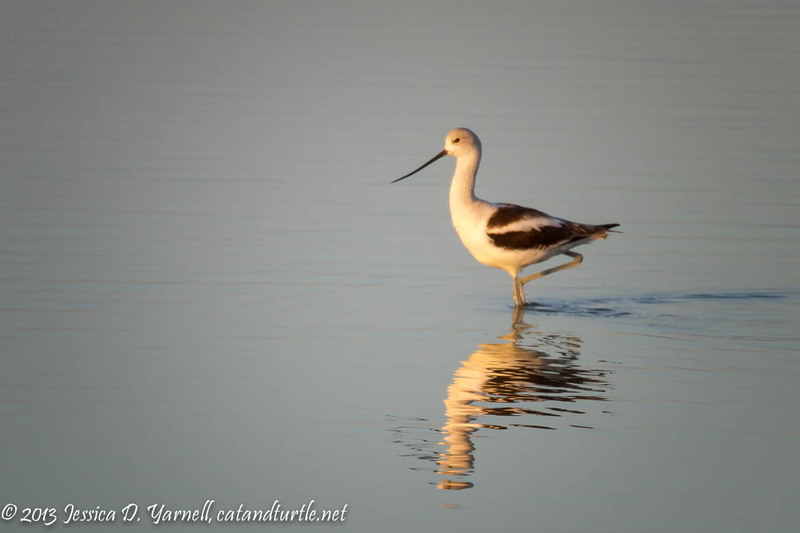 American Avocet, a rare winter visitor to inland Florida. This was the first time that American Avocets were included in the Lakeland Christmas Bird Count. Click on the photo to view larger. I found that birdy-birders are much less picky about picture quality than photographer-birders, which was good, because I left my Beast at home in anticipation of many miles of hiking. I was a little relieved when the rare birds had the rare sense to pose on the right side of the sun! We started the day expecting to find about a dozen avocets (the number found when the property was scouted in the past). But we kept finding more and more, finally reporting almost 50 birds. The silly birds wouldn’t get together for a group shot, though. Maybe next year! Black-necked Stilts. Another great bird for the Lakeland Christmas Bird Count! Black-necked Stilts used to nest at the Circle B Bar Reserve, sometimes even on the edges of the Wading Bird Way trail. Those were the days! :) Click on photo to view larger. Another known rarity was the Fulvous Whistling Duck, which is typically found farther south in Florida. As the population of Black-bellied Whistling Ducks has grown around Lake Hancock, a few Fulvous have started to be reported. A group of about fourteen birds was seen at the Circle B Bar Reserve about a month ago. Now those birds seem to have moved to the outfall wetlands. Smart birds – the wetlands are bigger, and there are fewer people to bother them! Our group counted several hundred Black-bellied Whistling Ducks taking off at sunrise, then we finally located the Fulvous flock. 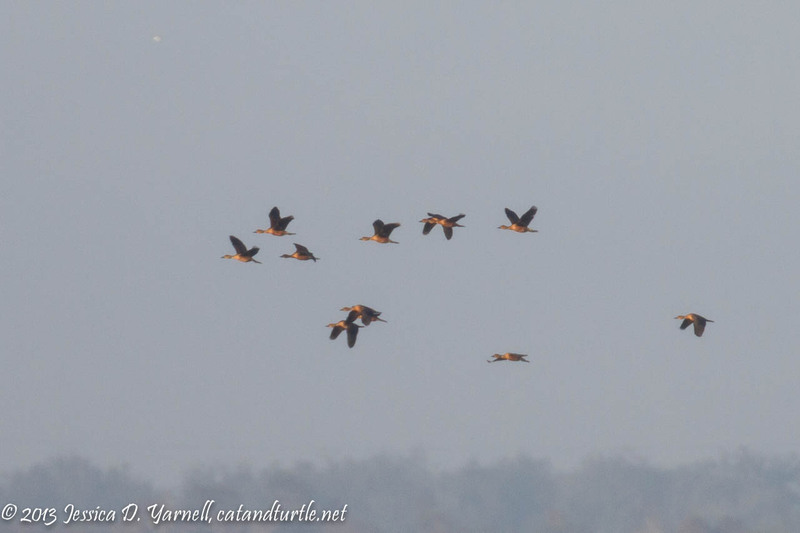 Fulvous Whistling-Ducks. I wished they had gotten closer! These birds are more brown than their cousins, the Black-bellied Whistling Ducks. Click on photo to view larger. I was a little surprised when we found more Least Bitterns than American Bitterns! 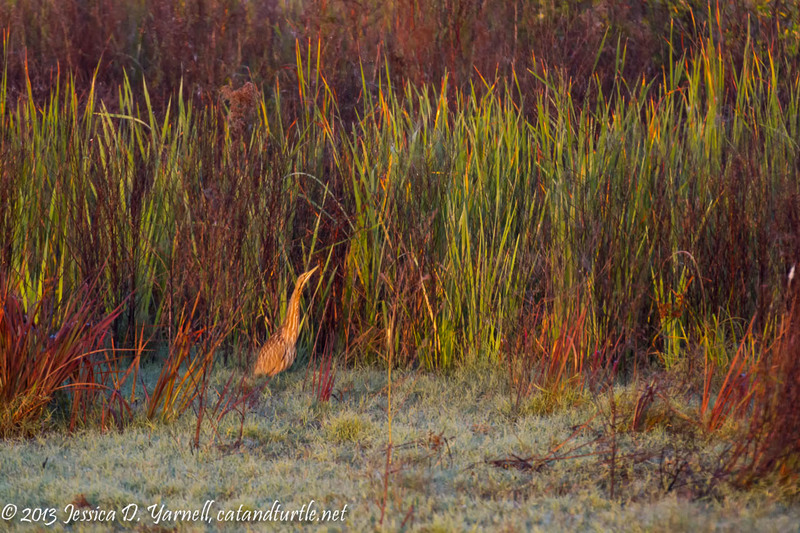 I was also surprised when we almost drove right past this American Bittern, who stood out in the open but blended in so well to his surroundings. I’m hoping for a good cold front to knock some of the vegetation at the Circle B Bar Reserve, which makes it much easier to find these secretive birds. American Bittern. See how well he blends into his surroundings? Click on photo to view larger. 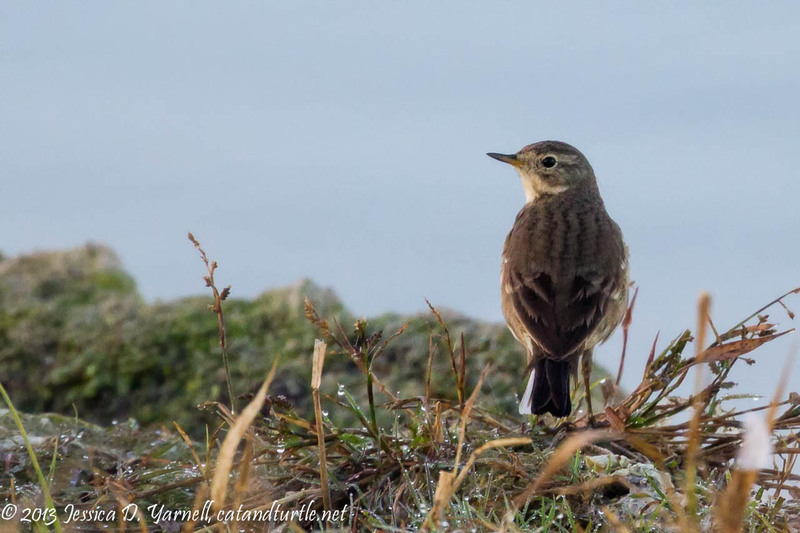 We found a small flock of American Pipits in the short mowed grasses early in the morning. I was thrilled to get close to these birds, who I’d only seen once before. American Pipit. These sparrow-like birds have a call like their name, “pip-it!” Click on photo to view larger. 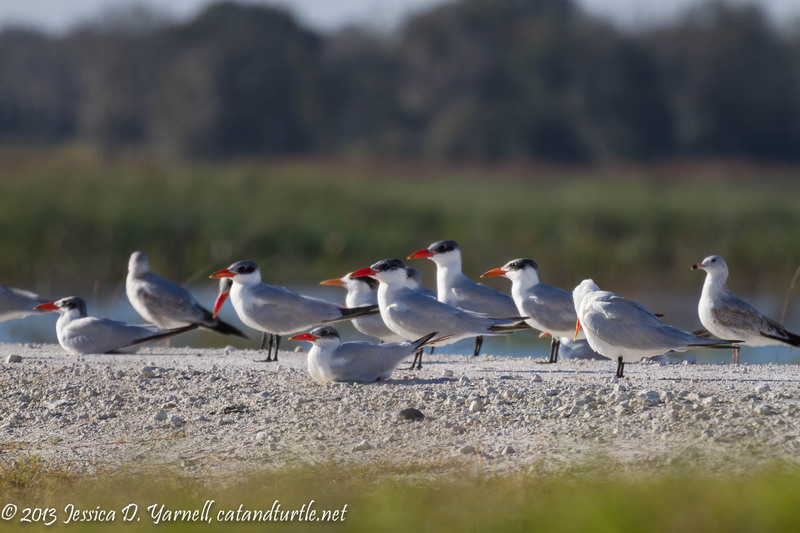 I was surprised by the dozens of Caspian Terns that we found in the wetlands. I’d seen them frequently flying over Circle B, but I wasn’t expecting to see so many together at the outfall wetlands. At one point a large group of them roosted on the trail, much like they used to hang out on the Wading Bird Way trail at Circle B.
Tern Hang-out. Look at all those brightly colored beaks! Click on photo to view larger. Franklin’s Gull. It looks like he’s yawning at us, when we were dancing with glee to find such a rarity on our Lakeland Christmas Bird Count! Click on photo to view larger. Franklin’s Gull in Flight. Click on photo to view larger. 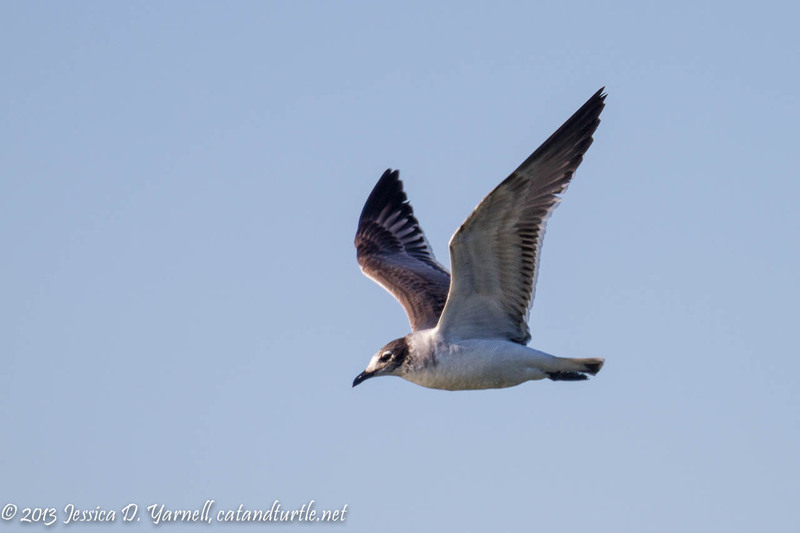 Now, you may be looking at the above photos and thinking, “hey, that looks like a wintering Laughing Gull. 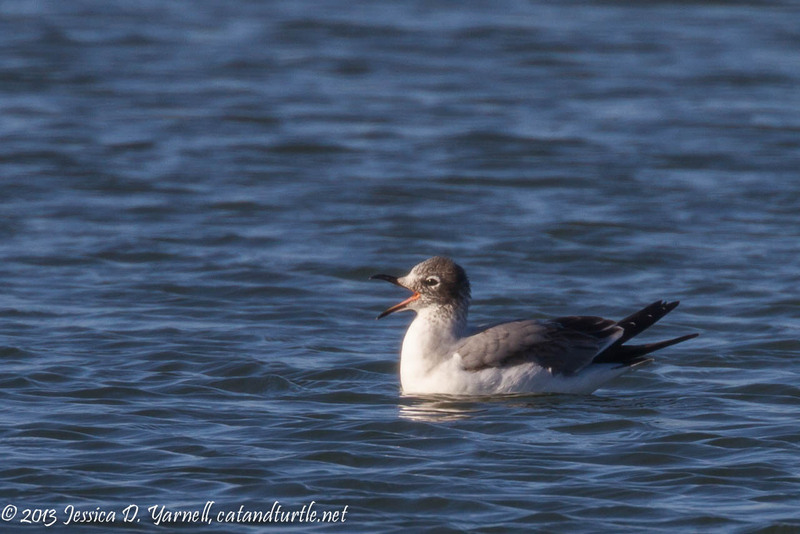 That’s not rare!” Well, the Franklin’s Gull does look a lot like a Laughing Gull, in both breeding and basic plumage. But the Franklin’s is found in the mid-west, with its range ending at the eastern end of Texas. The Laughing Gull is found in Florida and along the Atlantic and Gulf coasts. The Laughing Gull is a little larger than the Franklin’s Gull, and the Franklin’s has a white line between the black primary wings and the gray secondaries. In the wintertime, the Franklin’s has more black on the back of his head. The Cornell Lab of Ornithology describes it as a “half-hood” rather than a “smudge.” So all the signs pointed to our bird being a Franklin’s. It didn’t hurt that I had a team of great birders to confirm the ID! One of the incredible parts of the Lakeland Christmas Bird Count was the sheer numbers of American White Pelicans that we observed. It was like the year that they wintered on Wading Bird Way at Circle B – except there were easily two or three times the number of birds! They flew in from Lake Hancock to the outfall wetlands. Tom Palmer was kayaking the lake and counted 1,000 birds. We counted almost 7,000 in the outfall wetlands! It’s hard to capture that incredible number of birds in a photograph. I did my best. The photos are definitely better when viewed large. American White Pelicans in flight. 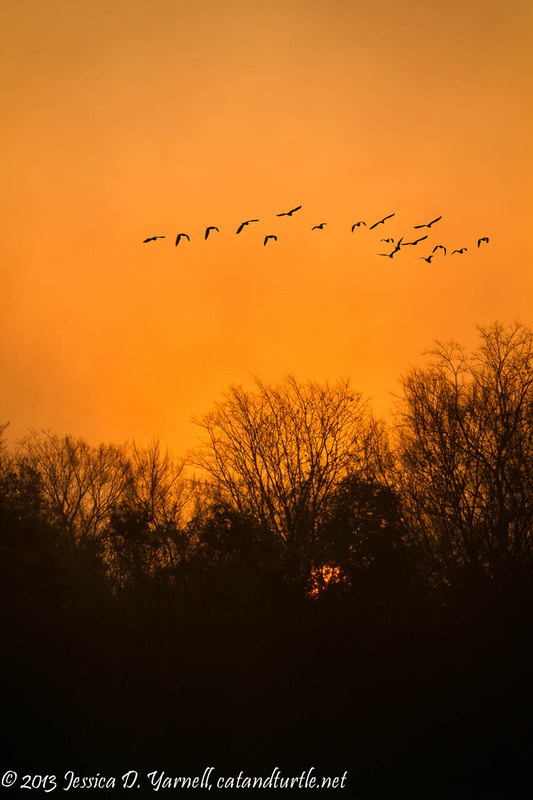 Isolating birds in flight is easy when they are constantly flying overhead! Click on photo to view larger. American White Pelicans. There are hundreds of birds in the air and even more in the water. Click on photo to view larger. American White Pelicans. This is a panorama of about 10 vertical images. Definitely click on the photo to view this one larger! We were giddy with excitement after finding the Franklin’s Gull and counting all those pelicans. But the day wasn’t done handing out rarities for us. We stopped to document the Black-necked Stilts (a.k.a. take a picture – my favorite part!). Cole noticed a Glossy Ibis that looked a little pinkish. I got a single shot before he flushed, and we identified a White-faced Ibis! This is another bird whose range is supposed to end around the eastern border of Texas. A few manage to find their way to Florida each winter. We found one! 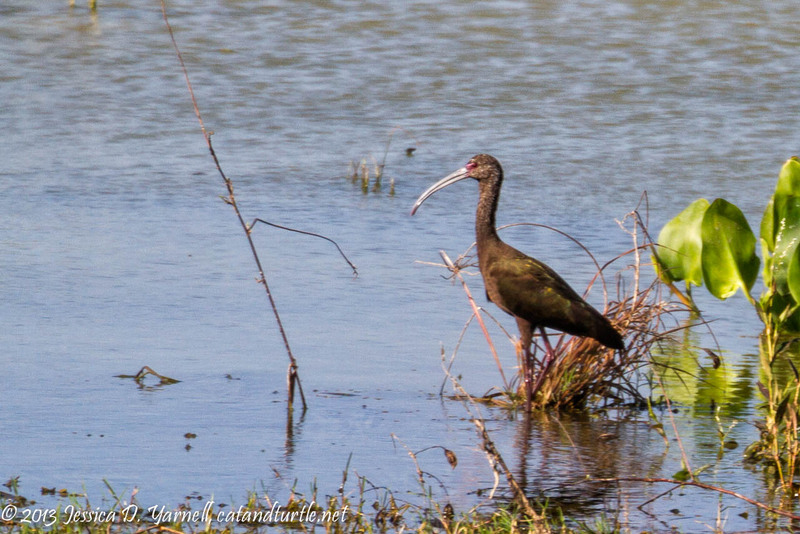 White-Faced Ibis. He’s similar to the Glossy Ibis, but his eye is red and his face is pink. He has white feathers on his head and a gray beak. Click on photo to view larger. The best was still yet to come. Debbie and Sydney drove off to look for songbirds (and found a Hermit Thrush!) Cole and I tried to spot one of the Least Bitterns we heard calling. Then Cole spotted a sparrow hopping around in some vegetation. I hurried to spot the bird as I heard him freaking out, “Orange triangle…gray nape…looks like a…what are you doing here! ?…you can’t be…” Yep, it was a Nelson’s Sparrow! I couldn’t find him at first, but we called him back out and he hopped out into the open for the camera. (Very good bird!) Cole was ecstatic. 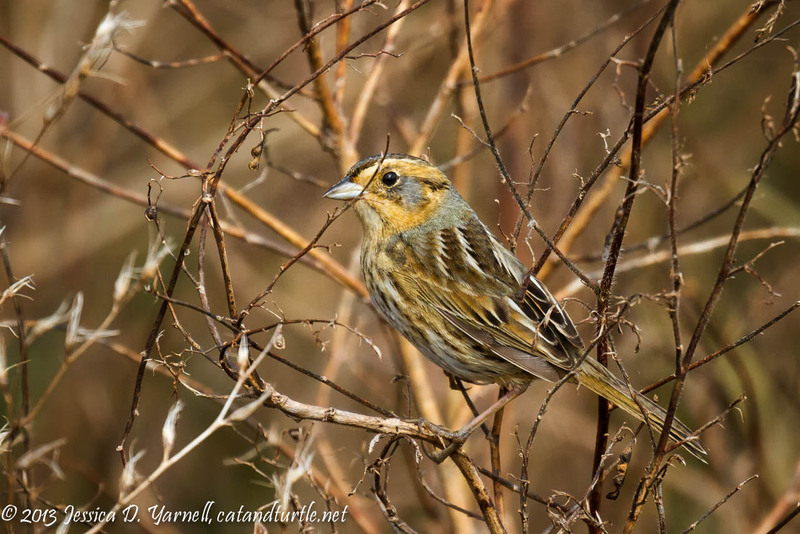 Nelson’s Sparrow. Another rarity for the Lakeland Christmas Bird Count! This guy’s Florida range is supposed to be the coastline of northern Florida. Not Lakeland! Click on picture to view larger. Our group had 89 species when we stopped for lunch. In the afternoon, we hiked through some woods along the shore of Lake Hancock, and then through some cow pastures, looking for songbirds. The wind picked up and birds were scarce. We found some warblers and vireos, and I enjoyed seeing the pretty fields and wetlands. Blue-headed Vireo. One of the last birds we found on our hike. He was near a Ruby-crowned Kinglet who showed off his ruby crown. Click on photo to view larger. We visited a few other limited access areas along the eastern shore of Lake Hancock, picking up several more species, like Eurasian-collared Dove and Wood Duck. We found almost fifty Sandhill Cranes in an open field. I was told that thirty years ago, a Sandhill Crane was a good find on the CBC, and only a couple were reported. Our total yesterday was in the hundreds. What an improvement! But the duck populations have dropped significantly (for example, 8,000 Ruddy Ducks dropped to several hundred). It’s this sort of information that is critical to scientists studying birds. Our group total for the wetlands was 100 species! The overall total for the Lakeland Christmas Bird Count was 144 species. A very good number for our inland region. When I got home around 10pm, excited and exhausted, Rich asked me what makes birders get up at 3:30am and look for birds all day. He said most people would describe the behavior as a little cuckoo. Then he asked if we’d seen any cuckoos that day (yes, there’s a family of birds called Cuckoos). There’s a small correction to be made. 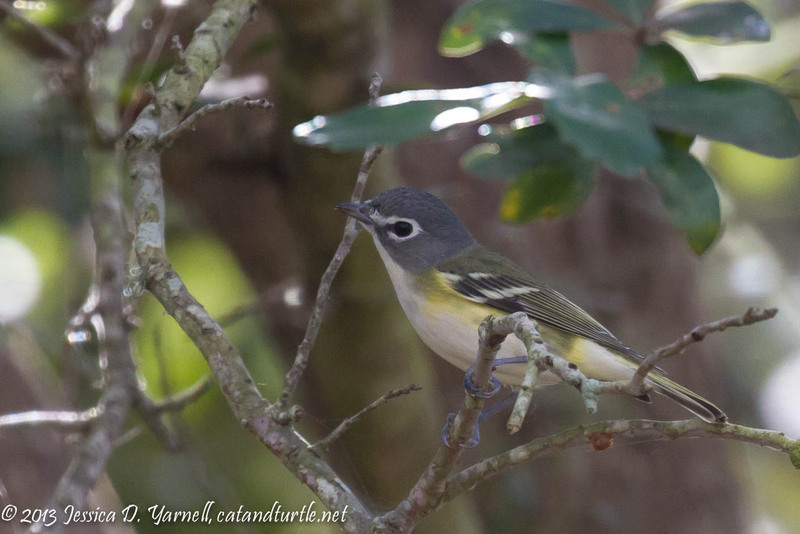 Your last image on the blog is a Blue-headed Vireo. Wow!!! How exciting!! I wish I had been there with you!! Now we know where all the wintering pelicans have gone too! I look forward to the day when I can visit the outfall wetlands! I know, it stinks that it’s restricted access. Of course, that’s probably why there are so many birds there. We were very grateful to SWFWMD for allowing us CBC access. But if the birds are across the lake, then I bet a few of them visit Circle B from time to time. My Lark Sparrow from a few weeks ago comes to mind. The naturalists also said that as the water restoration plants grow in, the habitat won’t be as good for birds. This was probably our best opportunity to view them. Maybe next year they will be back at Circle B! What a great day of bird observation and counting and love your blog post as well.